This may come off like the ultimate first world problem, but for people who collect things, it is a genuine question. If you’re buying a never removed from box (NRFB from here on out) doll – do you unbox the doll or do you leave her in her pristine boxed glory? 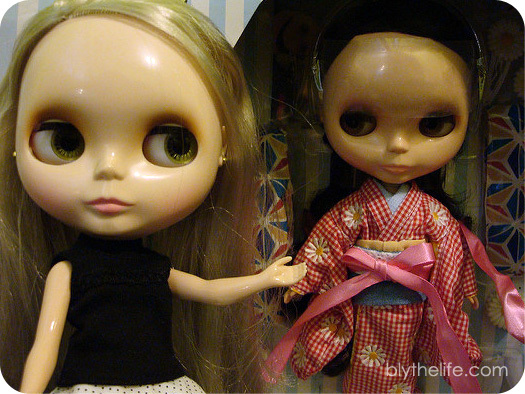 My first Blythe was NRFB, and I opened her straight away. Of my seventeen full sized Blythes, ten of them arrived to me NRFB (the ones that did not are: three Kenners, two customs, one SBL, and one BL). Mildly spoiled, I know, and I’ve unboxed pretty much every single one of my dolls – except for one. The only doll that I haven’t unboxed (although I have lifted off the clear cover…) is my ADG (Ashton-Drake Galleries) doll that I bought just this year. There are a few reasons for this and they’re kind of different from my usual reasons to pull the doll out. The primary reason why I purchased an ADG was because I didn’t already have one. One of my goals has always been to own at least one of each mold, and after (finally) getting a BL this year I really wanted to finalize my collection by rounding it out with a lone ADG. A local Blythe enthusiast was downsizing and I jumped at the opportunity to give her ADG a new home. It worked out great! She got a sale and I got the doll that I was ‘missing’ from my collection. I got her for the purposes of filling out my collection, I really haven’t felt the need to play with her. Her purpose in my doll family is to fill a blank space that an ADG was meant for. This is also coupled with the fact that I love her box. I love that they did a reproduction of the original Kenner box and it just feels like it was meant to be displayed. There are a few of the Takara boxes that I feel were made for display purposes as well (Margaret Meets Ladybug’s house-shaped box certainly falls into that category! ), but there’s something special about the reproduction Kenner box that makes me want to leave her in there. I just don’t feel a need to unbox her. Further, she also does not have a name because of the fact that she’s been left in there. Is that terrible of me? I don’t feel a sense of attachment to her, but it’s also not to the point where I feel like I would just sell her at a moment’s notice because she does fill a gap in my collection to the point where I do feel like my collection is “completed” (at least for now, I do want to get a few more BLs eventually, but probably not any time this year). 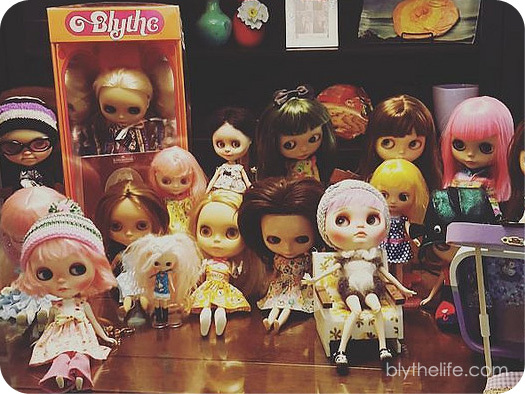 Do you unbox your Blythes, or do you leave them in their untouched boxed condition? Comment below and join the conversation! Question of the Week: Have you ever gotten a grail doll? I debox all my Blythes! They’re for playing with IMHO 🙂 but I also have other doll collections that I don’t debox – a lot of my Barbies are still in their boxes because they look really nice on display that way. I also debox all of my Blythes (all three), and like Andi B. Goode, I have some Barbies still in their boxes because they do look nicer that way. So, I can understand why you keep your ADG Blythe in the box. I think she makes a nice display. I love packaging and some boxes are just too pretty to not keep with the doll. I’ve opened every box. I have to. I have to get them out and tug that pull string and hear their eyes click. I unbox my Blythes, except for Precocious Candy’s Mushroom. I just love her box so much that the moment I saw her I knew I had to have her and would never unbox her. I’ve named her Amanita, but I’ll admit I’m the least attached to her since I never get to change her clothes or pose her. Still, I love looking at her in her precious prison, she’s not going anywhere. All but 1 of my girls came to me used. I don’t really buy NRFB unless there’s a new release, and even that’s rare for me.